Marcus Polak was born in Meppel on 4 February 1861. He married Henderjette Engers who was born at Winschoten on 1 January 1860. They had four children: Jansje (born in 1893; died half a year later), Henderina Jansje (1894), Leopold Frederik (1896) and Frederik Simson (1901). Leopold and Henderina attended Meppel grammar school (Rijks HBS), Henderina from 1907 till 1910 and Leo from 1908 till 1911. Neither of them got a certificate of this three-year-course. There is still a picture of Leo and his classmates in which Leo, with cap, is attentively observing the photographer Mr. van Rhijn. At first Markus had a clothes shop in Grote Kerkstraat together with his brother Jozef. After working together for years Jozef left for Amsterdam. Marcus then moved to 22 1st Hoofdstraat (on the corner of Woldstraat). There he ran a prospering shop and wholesale business selling better class gentlemen’s fashion until 1941, when the business was closed by order of the Germans and the stock was taken away. When a man needed nice clothes for a festive occasion, he bought them in Polak’s shop. Advertisements in the Meppeler Courant still remind us of this shop and the assortment of goods that was sold. Mr. Polak did a lot of advertising. He ran the business together with his unmarried son Leopold. According to people who still remember them, they were very nice people. 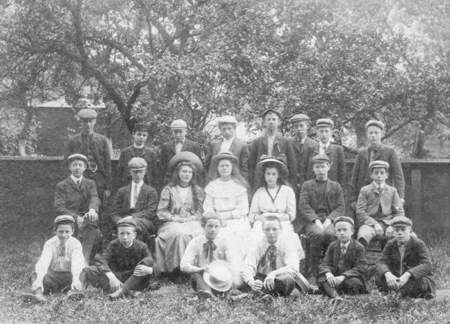 Leo Polak (sitting in the first row, 2nd from the right) as a pupil at the Rijks HBS. Then comes a moving moment, when Leo Polak mounts the platform. He reminds me of a plate of the French Revolution. Camille Desmoulins addressing the crowd in the gardens of the Palais Royal! But there was nothing revolutionary in Leo’s speech, on the contrary! His practical tips for the walk, in rhyme, were listened to attentively. While I stood behind Leo, waving our NUW flag above his head, I could see what he had in his pockets. They were loaded with peppermint, cigarettes, sweets and chocolate to relieve the long march for the participants. There would surely be some for Cordéjo [Cor de Jonge’s nickname, TR]. We have not had any reason to complain about that. A loud applause rewarded his speech (not because the participants had got cold hands as it was rumoured). After the walking tour Mr. Polak thanked everybody who had assisted in making the venture successful and handed out some prizes. He himself had also finished the walk, as befits a good chairman. Their son Frederik never married and died in 1935. The rumour goes that the family had a mentally handicapped child [we still do not know who it was, TR], that was often spotted behind a curtain of a window overlooking Woldstraat. The Spijkerman family, who lived next door, could see a small part of a room with straw on the floor. Every now and then they heard some sort of ‘howling’ and they also remember that the person (probably a man) was given a breath of fresh air in the backyard, sitting on a chair. When the war broke out father Marcus was 79, his wife 80. He was the first person to hand in a carefully typed letter, dated 19 January 1941, to the local authorities with the information required about himself and his two family members in connection with regulation 6/1941, which stated that all Jews had to be registered. He wrote: In connection with the regulation, I send you the data about my family as stated below. I enclose the three guilders due. 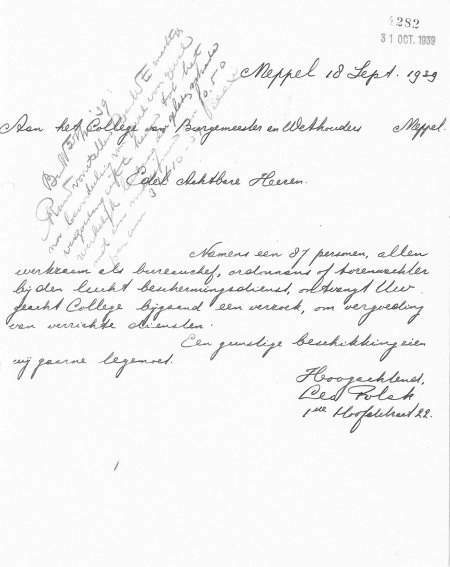 On 18 September 1939 Leo Polak wrote a letter to the Town Council asking for an allowance on behalf of 87 employees of the air surveillance service. The money was returned and Marcus will undoubtedly have followed the correct procedure this time. What further happened to him, we do not know exactly. We do know that early November 1941 he asked mayor Wisman to be released from the ban to employ Christians. Mr. Wisman considered this but decided the answer was ‘no’. The interim chief inspector asked policeman Tol on 5 November to take this message to Mr. Polak. On 20 July 1942 Leopold and many other men had to go to work camp Orvelte. His parents would never see him back. He disappeared from the camp on 24 August, long before his fellow- inmates were to be taken to Westerbork. He died on 31 August 1942 somewhere in central Europe. We do not know why he was transported to the east so quickly, what happened to him over there and where he died. In the mean time Marcus’ business was liquidated by Omnia. The German Seuser settled the job. Henderjette had become seriously ill, so the old couple did not have to go to Westerbork on 3 October. Their names were entered in a list of ‘legalized’ Meppel Jews. On a Fragenbogen zur Judenerfassung was stated that they the commander of the Sicherheitspolizei had given them permission to stay in Meppel in connection with the serious illness of Henderjette. It also stated clearly that this was not a reason to be released from deportation. This saved her from being transported to Sobibor. What happened to her mortal remains is unknown. One possibility is an illegal funeral at the Jewish Cemetery on the Zomerdijk, but this isn’t most likely because of the almost total absence of Jews in Meppel. Inquiry at the Cemetery didn't lead anywhere as well. And because her name is not on the Jewish Monument in Meppel or a Stolperstein, the memory of her - wrongly - has disappeared completely. A little satisfaction. Henderjette's name is mentioned on the national digital monument in memory of the Jews killed in WWII. Marcus was taken to Westerbork two months later. From there he was deported to extermination camp Sobibor on 17 March, where he was killed three days later. 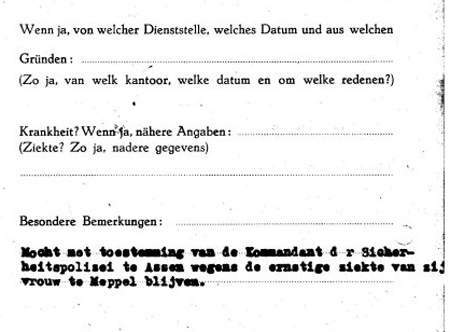 A week after Marcus’ deportation the mayor of Westerbork informed his colleague in Meppel: ‘I inform you that the persons on the list enclosed have gone abroad according to our information.’ Marcus, 83 then, was on it. As Henderjette died in Meppel and not in one of the extermination camps, her name is not mentioned on the monument in commemoration of the Jews of Meppel who died in the camps in World War II. Her husband’s name is on it.